1: Preheat oven to 350°F. 2: Cook sugar and water in a small saucepan over medium-high heat, gently swirling the pan (do not stir), until the mixture turns golden brown, 5 to 7 minutes. Immediately, pour the caramel carefully into a 9-inch round metal cake pan. If it stiffens before it completely covers the bottom of the pan, warm the pan in the oven, then swirl to cover the bottom. 4: Place the cake pan in a larger pan and pour enough hot water around it to come 1 inch up the sides. Bake until golden and set at the edges but still wobbly at the center, about 1 hour. A knife inserted in the center should come out clean. 5: Transfer the cake pan to a wire rack and let cool to room temperature, about 1 hour. Then cover and refrigerate for at least 4 hours or overnight. To serve, run a knife around the edge of the pan and invert the flan onto a plate. Nutrition Bonus - Calcium (18 daily value). Plus 37 othersFrom around the world! nice one ! I made it the other day and it came out perfectly :] everyone enjoyed it , thanks yous ! 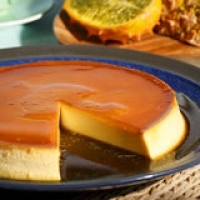 Love flan, and the picture is mouthwatering! Looks like another winner! Thanks! I really like flans. I have a good one with carmel top.. i'll have to dig that recipe out. look forward to trying this one. Oh it looks so yummy!